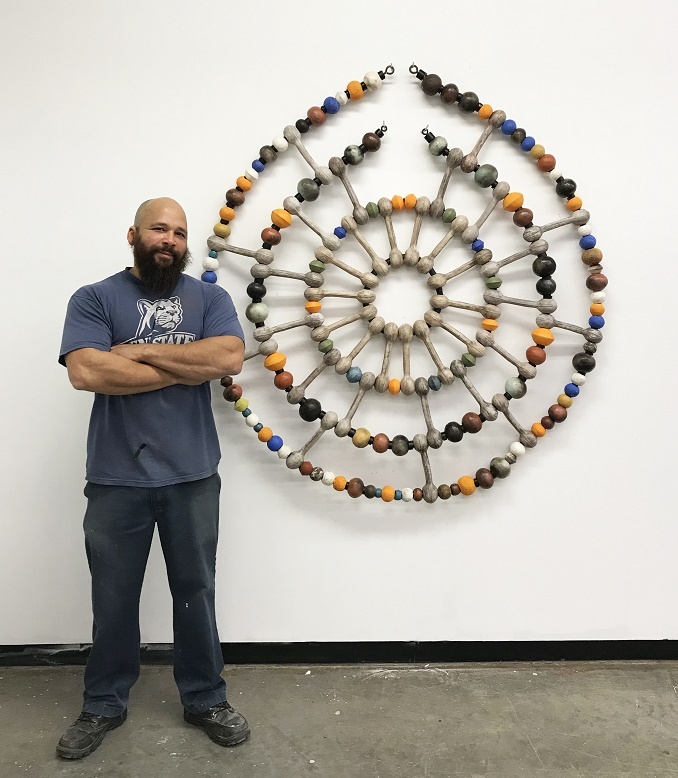 Sharif Bey, ceramicist and dual associate professor of art education in the College of Visual and Performing Arts’ School of Art and the School of Education, is one of four artists selected to exhibit work in “Disrupting Craft: Renwick Invitational 2018” at the Renwick Gallery of the Smithsonian American Art Museum in Washington, D.C., Nov. 9-May 5, 2019. Bey will exhibit 25 works. In addition to Bey, the exhibition features the work of Tanya Aguiñiga, Dustin Farnsworth and Stephanie Syjuco. All four artists challenge the conventional definitions of craft by imbuing it with a renewed sense of emotional purpose, inclusiveness and activism. By exploiting the conceptual toolkits of craft, they develop responses to the contemporary political landscape while also analyzing and challenging their own cultural histories. Bey produces both functional and sculptural pieces of pottery using a variety of forms and textures. His body of work reflects his interest in the visual heritage of Africa and Oceania, as well as contemporary African American culture. He explores the cultural significance of ornamentation with colorful large-scale beads that he assembles into adornment pieces. Also an active scholar, Bey regularly publishes in academic journals on art education. As a high school student in Pittsburgh, Bey participated in the Manchester Craftsmen’s Guild apprenticeship program, a formative experience that inspired his career. He went on to earn a B.F.A. in ceramics from Slippery Rock University, an M.F.A. in studio art from the University of North Carolina at Greensboro and a Ph.D. in art education from Pennsylvania State University. Bey’s work has appeared in solo and group exhibitions, including “Sharif Bey: Lived History and Cultural Memory” (2017) at Baltimore Clayworks. He has held residencies at the McColl Center for Visual Arts in North Carolina, the John Michael Kohler Arts Center in Wisconsin and most recently the Pittsburgh Glass Center, which culminated in the exhibition “Sharif Bey: Dialogues in Clay and Glass” (2018). His work can be found in the collections of the Carnegie Museum of Art in Pittsburgh and Hickory Museum of Art in North Carolina, as well as the United States Embassies in the Sudan and Uganda.